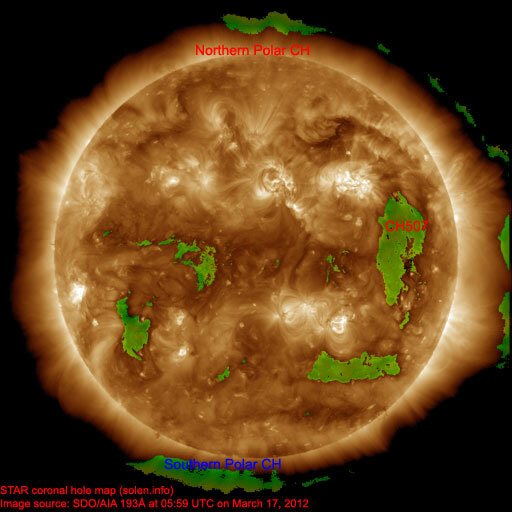 Last major update issued on March 17, 2012 at 06:30 UTC. 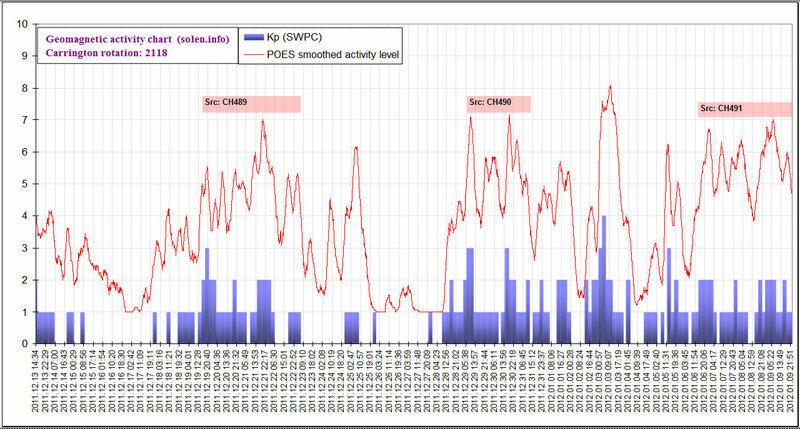 Data source change from March 16: The source for planetary A and K indices has been changed from SWPC to WDC (Potsdam) to improve data quality. The change has been applied to old data in the above plot and will gradually be phased in where those data are otherwise used in STAR. 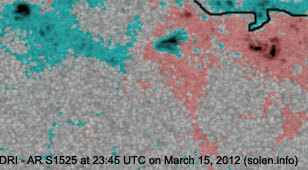 The geomagnetic field was active to minor storm on March 16. 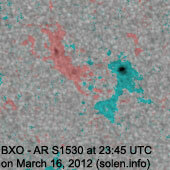 Solar wind speed at SOHO ranged between 547 and 801 km/s. Early in the day the dominant solar wind source was a CME, then gradually the high speed stream associated with CH507 became dominant. 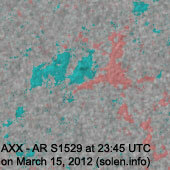 Solar flux measured at 20h UTC on 2.8 GHz was 98.5 (decreasing 5.6 over the last solar rotation). The planetary A index was 33 (STAR Ap - based on the mean of three hour interval ap indices: 33.0). 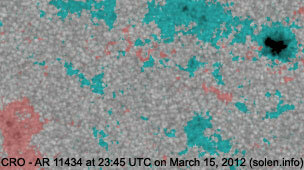 Three hour interval K indices: 54454544 (planetary), 53433433 (Boulder). 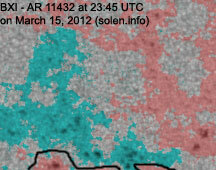 Region 11432 [N15W27] decayed further and could soon become spotless. 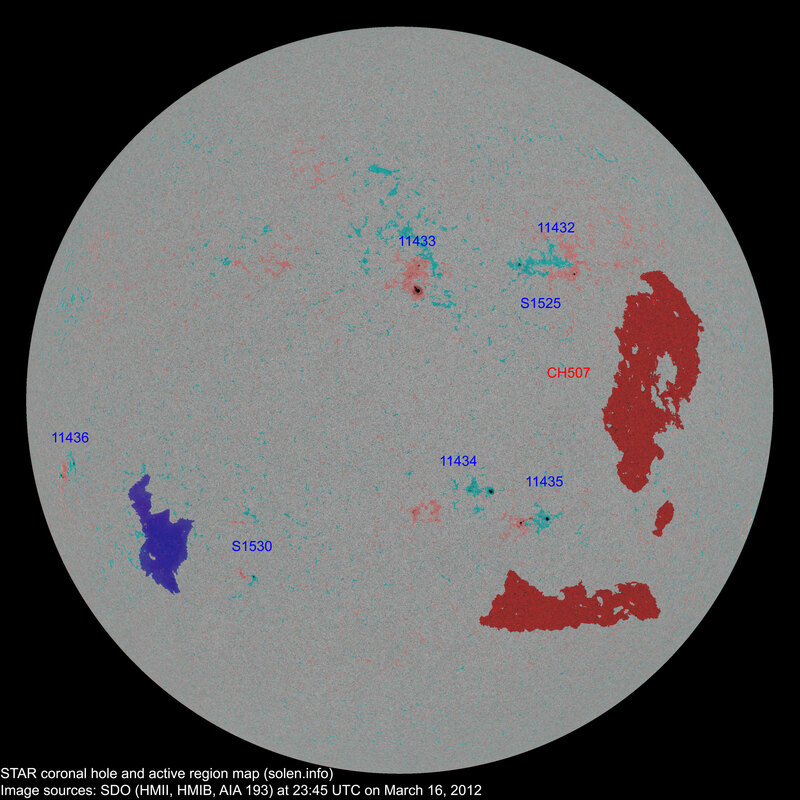 Region 11433 [N10W03] decayed significantly and was mostly quiet. Region 11434 [S22W01] developed slowly and quietly. 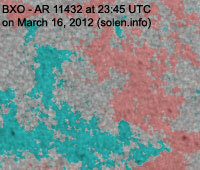 Region 11435 [S25W23] was quiet and stable. 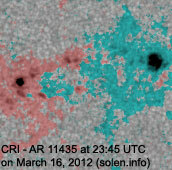 New region 11436 [S13E66] rotated into view at the southeast limb on March 15 and got an SWPC number the next day. 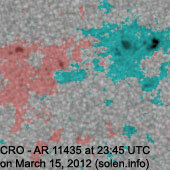 [S1525] was split off from region 11432 on March 13. 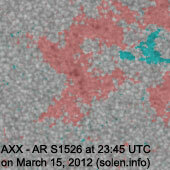 Decay was observed on March 16. Location at midnight: N13W24. 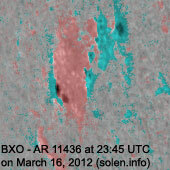 A filament eruption in the northwest quadrant was observed late in the day, the associated CME was seen off the northwest limb and the north pole. 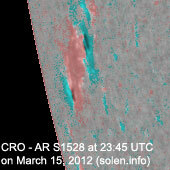 March 14 and 16: No obviously Earth directed CMEs were observed in LASCO and STEREO imagery. 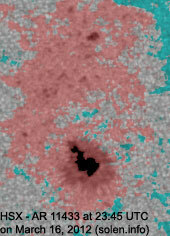 A large recurrent trans equatorial coronal hole (CH507) was in an Earth facing position on March 13-14. The geomagnetic field is expected to be unsettled to minor storm on March 17 due to a high speed stream from CH507, quiet to unsettled is likely on March 18-19.